Post Pop Depression, the 17th Iggy Pop album, and a worthy addition to the 22 album legacy spawned with the immortal trilogy of The Stooges, Fun House and Raw Power, spanning massively influential solo outings including 1977's opening 1-2 combo of The Idiot and Lust For Life, and 1990's gold-certified Brick By Brick. 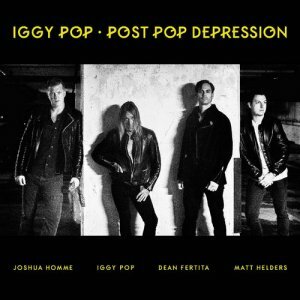 The first Iggy Pop album co-created with producer Homme, Post Pop Depression began with a succinctly worded text from Iggy to Joshua, and was realized in seclusion with Homme's enlisted aid of his Queens Of The Stone Age bandmate and Dead Weather-man Dean Fertitia and Arctic Monkeys drummer Matt Helders. Post Pop Depression is a singular work that stands proudly alongside the best works of either of its principles, from The Stooges to Queens Of The Stone Age, bearing its creators' undeniable sonic DNA while sounding like nothing they've done before. It's a record that wouldn't exist without either Pop or Homme-and one that probably shouldn't in theory if you really think about it-but it does, and we and rock n roll are all the better for it.